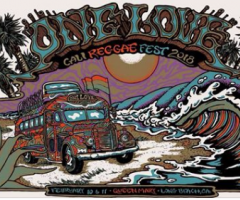 Back in its 4th year and returning to its upgraded spot along the shores of Long Beach at the Queen Mary is One Love Cali Reggae Festival: southern California's fastest and fiercest reggae-rock festival to date. Now stretching three full days February 8th-10th, jumping from one its inaugural year, One Love 2019 has taken shape just in time for the holidays with the most stacked lineup you could possibly imagine. Seriously, there may not be a name missing from it. ... One Love 2019 has taken shape just in time for the holidays with the most stacked lineup you could possibly imagine. Now, in the reggae-rock realm, there are only so many acts to compile together that can fit into such a niche market. That said, One Love has managed to get every band you can think of together in one location throughout three days. We're not kidding. How about we go by day? 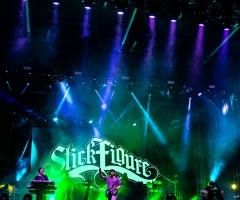 Friday has the heralded boys of Rebelution and Stick Figure at the headlining helm, with direct support Tribal Seeds and Pepper. Woah, what a rush already, right? Also on Friday is Trevor Hall, Mike Love, The Expendables, Landon McNamara, Long Beach Dub All Stars, Ballyhoo!, Iya Terra, Passafire, The Delirians, Arise Roots and Bikini Trill kicking it all off. Not to mention Don Carlos on the boat that night! And, wherever Don Carlos goes, Stoopid is sure to follow. Speaking of, Slightly Stoopid is headlining Saturday and the One Love crew is doubling down with Dirty Heads – on the same night!! Stoopidheads meet Dirty Heads... double trouble. Lest we forget, east coast industry giants SOJA and Dispatch are joining the Saturday party, right after Fortunate Youth, Matisyahu, Pacific Dub, The Movement, Yellowman, Mad Caddies, Lee Scratch Perry, Mike Pinto, The Expanders, Fishbone, Tomorrows Bad Seeds, Pato Banton, The Holdup and Ital Vibes opening that morning. A lot of ska and roots added for Day Two. And, to top it all off, the Caribbean's most finest Collie Buddz will be performing the afterparty 'til the wee hours of the morning. Although almost unimaginable, after all the compounded merriment from the names above, One Love Cali Fest wants you to make it to Day Three. They do. And, you should, since Day Three truly takes it up a notch. First off, Kyle Smith starts it all off which is mind-blowing. Make sure to get there early, because those boys are sure to have a midday spot by next year. Following that are The B Foundation, Mystic Roots, The Simpkin Project, Nattali Rize and Katastro to take you into the evening. 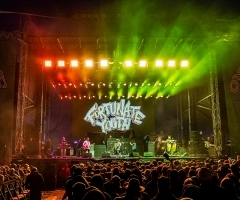 Josh Heinrichs and Groundation, new to One Love, will be entertaining festivalgoers into the evening, before Katchafire, The Green, Common Kings and J Boog lead on up to Iration and headliners Atmosphere and Sublime with Rome. Ending an LBC reggae-rock fest with LBC-native Sublime members, fathers of reggae-rock, is just too good too be true and too crazy to miss. With February right around the river bend, the One Love crew is opening up weekend, daily and afterparty passes all at once as of this Saturday, November 19th at 12pm PST. 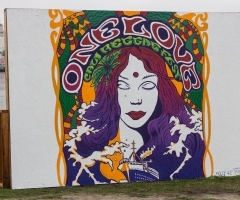 Make sure to mark your calendar and set an alarm for Saturday, folks, because One Love always sells out and this year, it's going to sell out in record time. Luckily, for those that can't spring for a full weekend pass, daily lineups have already been disclosed to pick and choose from. There isn't any clarity at this time pertaining to the usual Thursday preparty aboard the Queen Mary although that may be subject to change. What is known is the Friday and Saturday afterparties featuring Don Carlos, Collie Buddz and Fiji will be off the chain! 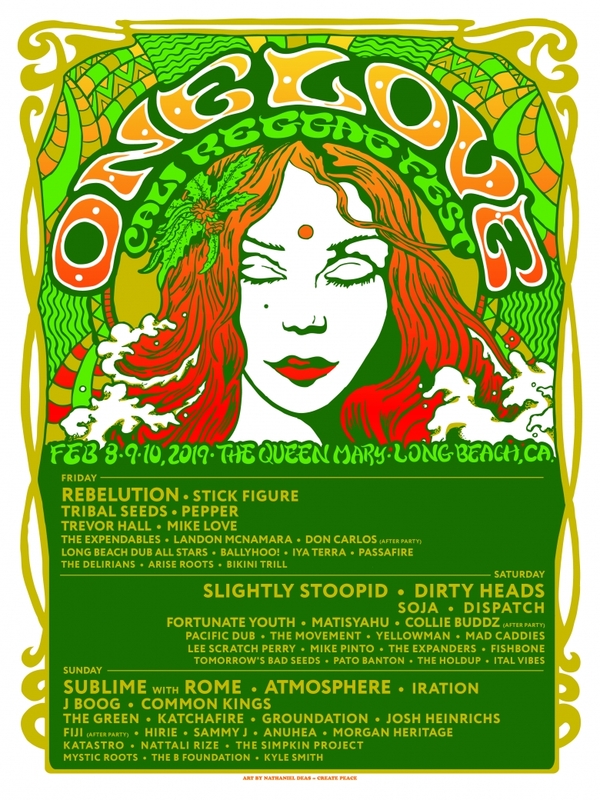 For more information, visit www.onelovecalifest.com.